Picked this up during one of my many visits to the university library. Didn't really expect much based on the gaudy cover, but it's pretty fantastic. Obviously, I don't know much about the musicians or anything else, so I'll type up the liner notes, which give light to it. Bear with me. An Indian adaptation of a stringed instrument found in Iran, turkey and elsewhere in the Middle East, the santur resembles a western hammered dulcimer, and is known technically as a box zither. The instrument contains up to one hundred strings and was developed and popularized on the Indian concert stage single-handedly by the Kashmiri musician Shivkumar Sharma, who remains the senior practitioner today. The challenge of the fixed pitch santur is to capture, as far as possible, a musical style based on traditional vocal music. Continuing the tradition of adaptation, Tarun has made some modifications to his instrument in both structure and technique. Tarun's own music education illustrates a multidirectional flow of diverse influences. Surrounded as he was by music (both is parents played the sitar) he began by playing tabla, the predominant percussion instrument of North India. As his interest in santur developed, he studied with his father's teacher, Calcutta's Pandit Dulal Roy, knowna s a performer on santur and the rare jaltarang (a series of water-tuned china bowls). Finally, Tarun chose as his ultimate mentor the world renowned Pandit Ravi Shankar, the sitarist who in turn had studied with legendary Ustad Allaudin Khan (1862-1972). Allaudin Khan performed on the sarod, but he was an exceptionally versatile musician who taught more than a generation of India's senior masters on a variety of instruments. The performances on this CD include two South Indian (Carnatic) ragas played in North Indian style: Kirvani and Hamsa Dhwani. The Northern and Southern traditions share common historical and theoretical roots; both are based on ragas (melodic structures) and talas (rhythmic structures), but each is distinctly different in performance style, musical instruments, and ornamentation. Rag Kirvani is the first selection, and its scale is the same as the western harmonic minor scale - seven notes, with flatted third and sixth. The first sounds we hear are a series of two-note chords innovatively plucked with the fingernails. These are followed by a downward cascading strumming on the full scale which introduces a brief alap, or non-rhythmic introduction. Following the crispness of his plucked notes, Tarun's continuous light hammering on the strings draws out the melody of the alap almost in a whisper. In developing the lower octave, Tarun demonstrates his innovative use of variable pitch: he has added a lower string to the instrument which he presses down and releases with one hand to create glides and sliding sounds otherwise impossible on the santur. In the continua-alap, Tarun explores the harmonic characteristic of Kirvani, often skipping notes in a type of arpeggio structure which recurs throughout the performance. After an alap of approximately nine minutes which ascends all the way up to the top of the third octave, Tarun introduces a composition (gat) in a medium japtal rhythmic cycle (10 beats counted as 3-2-3-2). Bikram Ghosh (son of the renowned tabla master Shankar Ghosh) introduces the tala with a subtle and delightful improvisation which emphasizes the fluidity of the variably-pitched left hand drum, or bayan. The two performers, Tarun in the lead, then proceed to blend aspects of the raga with the assymetry of the tala in a sensitive and dramatic interaction. Tarun sometimes tempers bright tones by damping (lightly touching the strings) with the free hand. Both musicians, in their respective and joint improvisations, reveal their exceptional virtuosity and youthful energy. 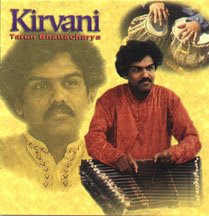 Beginning at around nineteen and a half minutes, the performers begin the conclusion of the raga with a fast gat in tintal (sixteen beats), and a vigorous dialogue in the techniques known as sath sangat (playing the same complex rhythmic patterns together) and saval-javab (question and answer), in which one performer echoes the improvisations of the other. Once again, Tarun fully explores the tonal colors of the santur with a combination of open, muted, delicate and vigorous sounds, striking with the santur's delicate twin hammers. One of the final stages of the performance is the climactic section known as jhala, in which a sort of floating melody line is alternated with a rapid repeated striking of the tonic/drone strings. A final saval-javab brings Rag Kirvani to its final jhala, and concludes with a thundering chakardar tihai, a cadential rhythmic pattern of three subdivisions which is repeated three times in closure. The second piece is Misra Anandi, equivalent to the western major scale with a romantic ornamentation of a full range of accidental notes. A brief alap introduces a lyrical composition in the eight-beat tala known as kaharva. A final alap-like structure recounts the basic melodic structure of the raga. The third piece is a beautiful Assamese folk tune, played in a scale parallel to a western major scale and with a light-hearted six-beat rhythm (tala) known as dadra. The recording concludes with a brief rendition of Rag Hamsa Dhwani, a pentatonic Carnatic raga. The scale does not use the fourth and sixth notes, and the remaining notes are played in the western major scale. After a brief alap, the musicians share a composition in medium fast ektal, a twelve-beat cycle. The variations here are simple and more traditional than those in the opening raga, and after a simple tihai, Tarun concludes this recording with a refined, sweet and gentle ending.